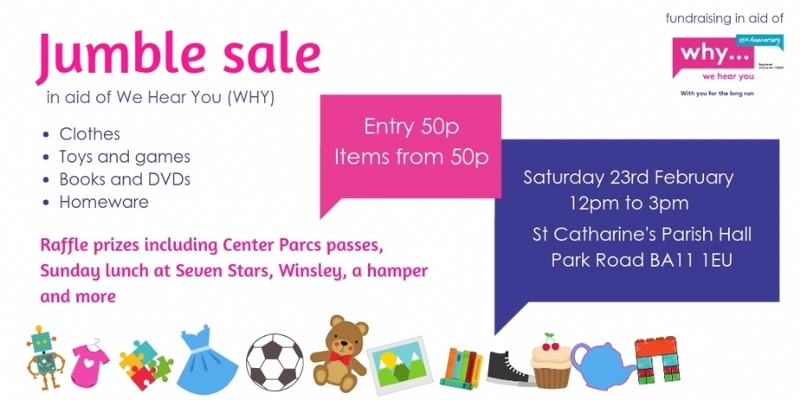 Pop along to St Catharine’s Parish Hall on 23rd February between 12-3pm to grab some bargains, buy some raffle tickets to give you a chance of winning some fab prizes, come and have a drink and some lovely cakes and to support the local charity We Hear You (WHY) a Cancer Counselling Charity. We Hear You (WHY) provides a free professional counselling service for anyone affected by a diagnosis of cancer or another life threatening condition. This includes family, friends, colleagues and carers as well as patients. WHY recognises that the need for emotional support to cope with the traumatic experience of a life threatening condition has no time limit, so our service is available to anyone who is or has been affected or bereaved by a life threatening condition at any point, even if the experience was a long time ago. On 31st August - 1st September a team of over 25 for WHY will be taking on the challenge of The Three Peaks where we will hike up and down Ben Nevis, Scafell Pike and Snowdon all in aid of celebrating We Hear You’s 25th Anniversary (formerly known as Postive Action on Cancer). So in 2019 we are running several fundraisers to help raise £25,000 for WHY being the 25th Anniversary of course! !